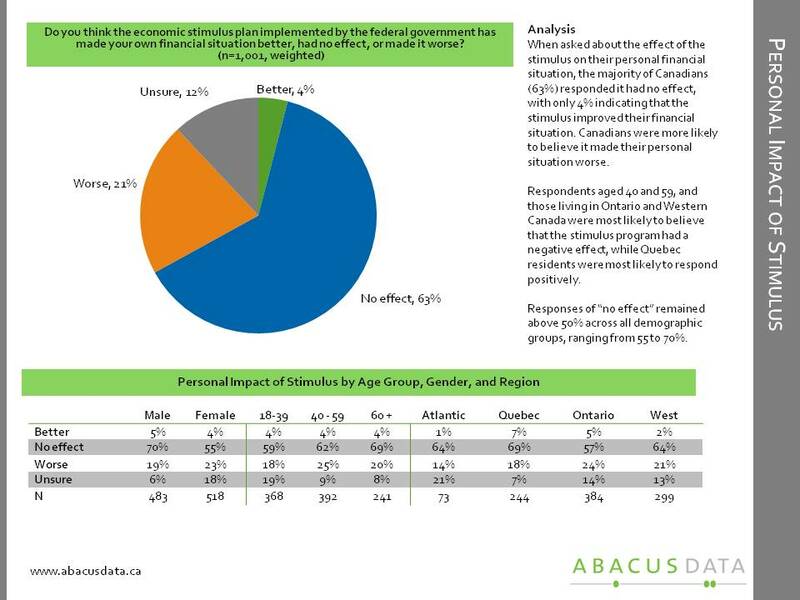 Although a survey of different people, we conducted a survey in early November that asked Canadians whether the federal government’s stimulus plan was having an impact on the economy and on their personal finances. The findings were quite striking. Only 26% believed the stimulus plan made the economy overall better; 35% believed it had no effect. The PBO’s report aligns with what we were seeing among the public – the stimulus plan wasn’t being felt. Despite the extensive advertising campaign, a large majority of Canadians did not know how much was spent on the plan and most believed it wasn’t having a positive effect on the economy or their own finances. It’s no surprise then that a plurality believed that the government should stop its focus on stimulating the economy and instead focus on reducing the deficit. If it’s not making an difference, why keep doing it? That’s what Canadians are thinking.